Mike Stone for GTM: Norway has a lot of hydroelectric plants: a total of 937 of them, which provide a population of 5 million with around 98 percent of its electricity. 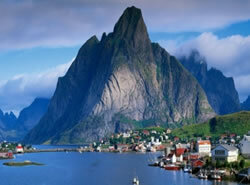 In fact, the Scandinavian country is home to roughly half of all the hydroelectric water storage reservoirs in Europe. This vast system could also offer a Europe a substantial amount of energy storage -- up to 20 gigawatts of it -- if an ambitious scheme currently being proposed can overcome political and social hurdles and get the necessary funding. That’s according to Kaspar Vereide, an engineer at the Norwegian University of Science and Technology in Trondheim. And his models suggest it could all be achieved in seven years.